Atlantis Evo coils are Kanthal Clapton coils - 0.4ohm & 0.5ohm, which enable the EVO to achieve your preferred taste requirements when using a wide array of E-liquid flavors. Atlantis Evo coils are Kanthal Clapton coils with resistance 0.4ohm and 0.5ohm. 0.4Ω coils have larger airflow for greater vapor production and balanced flavor. 0.5Ω coils produce a more dense vapor highlighting the flavor differently. Switch between EVO coils as required to ensure you are maximizing your vaping experience. 5pcs each pack. 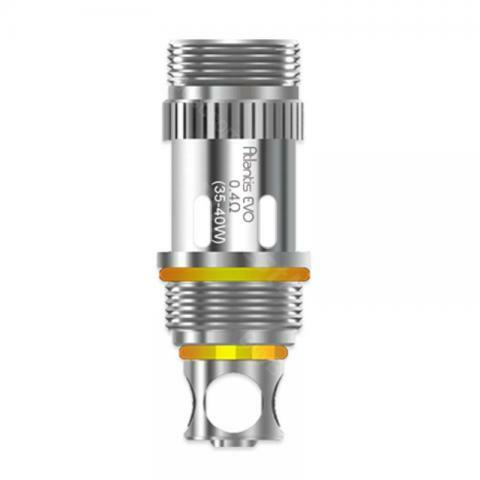 • Compatible with Atlantis EVO Tank, Atlantis Tank and Aspire Triton Tank (not Triton mini). I bought this almost a year ago and I love it and am still using it. The Black is starting to wear off but apart from that it’s a great little vape that can produce big clouds and great flavour. Have customised it to show my name too which I think is fab! Very fast service! Bought this for my son as he dropped his last one. He says it very good and would recommend. Aspire Atlantis Evo Atomizer Coil is a 5pcs/pack coil with a 0.4 ohm & 0.5 ohm resistance. Made with 100% Organic Cotton Replacement Coils, suitable for KangerTech.